Birding Is Fun! : Kicking a Birdy Bucket List-Across the Sea! Ever heard of a bucket list? Well it’s that list of things that you want to do before you “kick the bucket”. I have lots of things I want to do—places I want to go. Skydiving, climbing Mount Kilimanjaro, hike the Grand Canyon, Katmandu (yeah that's really, really where I'm going to...) —you know, ordinary stuff like that. I think it’s important to have a list of wild and crazy things you want to do because there’s only so much time and tons of wonderful things to do! Dream big! For many folks it helps to focus their lives and perhaps give them goals to shoot for. We all need that. But then I have another bucket list. It’s my birding bucket list. For now I’m going to tease with a partial list. It only includes my international wants! Maybe next time I’ll share my good ol’ US of A list. So here you go, the places and birds that I would like to experience before that last great “tick” sends me to—well—wherever. So here goes. My international “birdy” bucket list top 5! 1. Birds of Paradise and New Guinea. Yep. There are a few last great truly wild places on earth and New Guinea is one of them. With lush mountain forests and tropical lowlands full of mystery, it’s a place that seems at the end of the world. So imagine waking to a dawn chorus of shrieks and shrill whistles, other worldly cackles,crackles and pops and buzzes. And those are just the songs and calls! Birds with plumages that are so ornate as to appear artificial and behaviors that seem just as alien, I want to see them.—all 39 species. 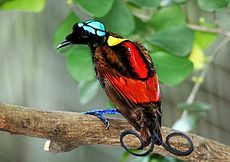 Check out the Cornell Birds of Paradise project Cornell Birds of Paradise Project and perhaps you’ll be as anxious to fly to the ends of the earth as I am to witness the “miracle of evolution” in action! Oh yeah, picking up a Cassowary while I’m there—to see what can be a real life (and very dangerous) “Angry Bird” stalking through the forest understory like a feathered dinosaur—that would be pretty cool too! 2. 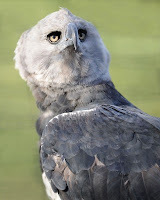 Harpy Eagle and forest falcons in Amazonia. So I’m not really an uber raptor guy but the sight of a Harpy eagle swooping through an Amazonian forest canopy, snatching a sloth the trunk of a tree or a Capuchin monkey from the midst of its troop would be beyond awesome. It would be the tick of a lifetime! With a steely stare that intimidates and monstrous talons that could do some serious damage—maybe sending a careless human to an earlier bucket kicking---it is a very lethal eagle. And then there are the “other raptors” that defy bird of prey decorum and actually sing! The Micrastur genus is amazing. They wake the lowland forests with amazingly beautiful and haunting calls and songs. I must return to the deep recesses of Amazonia to witness it for myself. 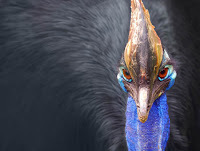 My PhD student Peggy Shrum is doing research on some of these amazing birds has invited me down there to experience it. I can't wait to go! 3. East Africa and the Great Migrations. Most folks travel to the Great Plains of East Africa—Kenya, Tanzania –the Ngorongoro Crater, the Serengeti, Great Rift Valley—to wonder at the marvel of mammalian megafauna. Yes, I do want to witness the great migrations of wildebeest and zebra . I would love to see the drama of predator and prey unfold as lions, leopards, cheetahs and hyenas shop the great herds like a moveable feast on hooves. And yes, to see a twenty foot Nile crocodile chomp on a gazelle like a snack would be thrilling. But along with that there are the birds. There’s an amazing array of bird diversity that I want to witness amongst the big hairy things. 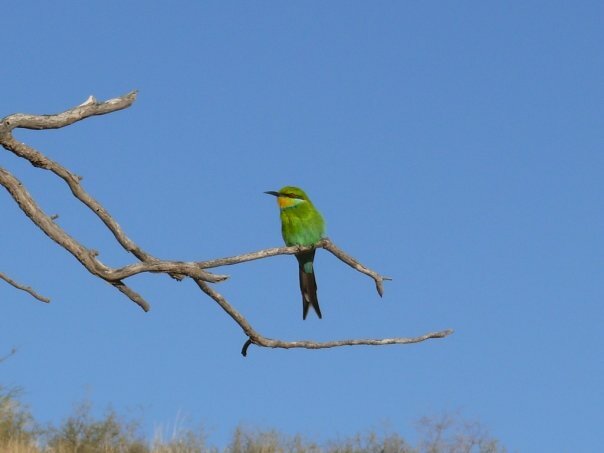 Rollers, raptors (especially a diversity of vultures that are TRUE raptors and not pseudo-storks), bee-eaters, secretary birds, ground hornbills. I’d like to bird with a Massai , a true local wildlife expert who could show me hot spots off the beaten tourist trap trail! Just be careful scoping sand grouse at the Mara river. There are some big ,scaly, toothy reptiles that will kick your bucket for you! 4. Botswana and the Okavango Delta . “Water water everywhere and more birds than you might think”. The Okavango drains huge portions of South Africa and when the seasonal floods come, the birds concentrate in a diversity and abundance that is astounding. So yeah, so a bite from a Tsetse fly or a mosquito might give you a lot more than an itch, the risk would be well worth the risk to see Malachite Kingfisher, Shoebill storks, Pel’s Fishing Owl, Hammerkop and on and on. Did that “whet” your appetite? 5. Brazilian Pantanal. Yes, another wetland. Another BIG wetland! Yes wetlands are where it’s at and few can rival the Brazilian Pantanal (other than my #4 choice!). With the bird count nearing 1,000 species and the chance to see things like Jabiru storks and the critically endangered Hyacinth Macaw, there’s no question that this is the neotropical wetland that I want to be knee deep in—just watch for anacondas. Yeah. So there you go my fellow Fun Birders! My top five choices for places I MUST see across the sea before I punt the pail! There are of course others that are on my list but I’ll let these marinate for a while. In the meantime I'm gonna update the passport, get some shots and dust off another bucket! So what’s on your birdy bucket list? Do tell! After reading this wonderful post, I'd like to add all the places you mentioned to my bucket list. Years ago, before I became very interested in birding, I was fortunate to travel to Kenya, Uganda, Namibia and South Africa. 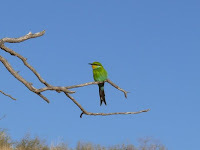 The birds I saw were AMAZING, as well as the wildlife! I hope you can knock a few of these wondrous destinations off you bucket list in the near future. Fantastic post!